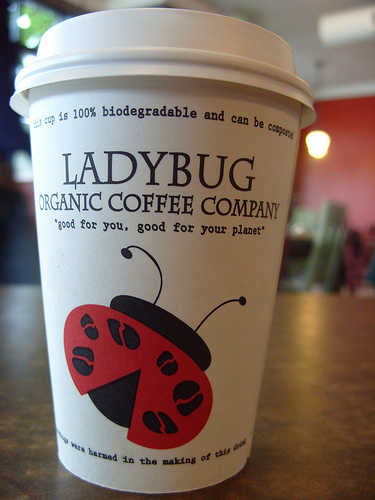 I've discovered a wonderful new place to write: Ladybug Organic Coffee Company. Or maybe it's a wonderful new place to have coffee and eat and talk about writing. And write IF there are not a large group of kids running around. Don't get me wrong. I am 100% behind the idea of having kid-friendly, mom-friendly, let-the-kids-be-kids restaurants and cafes. Really. And this place is great for that. I'm probably giving the wrong impression. I did meet with a couple writer friends here for the purpose of conversation and writing - which we did. And it was lovely. And it was just the wrong day. I really do recommend it. The coffee was exquisite and the foam art on the latte beautiful; the eggs and rosemary potatoes delicious and they have homemade ketchup, salsa, and jam which are - well, no other word than - yummy. It was just the wrong time and wrong day for me. There was a mothers' group there, each seemed to have an average of two kids with them and all under, oh, six or so. So it was noisy and visually distracting and - if I wasn't there to write - I might not even notice. So maybe this is just a heads up that, if you don't want kids running around, check with the restaurant. It's totally worth going to - but see if the monthly (yes, I overheard them say "see you next month") mothers and young children group is there if you want it quieter. Quieter - depends on who's running the music while you're there. And for some of us, music is not an issue! You can check here Cafe Connoisseurs and Writer Capers for more information about the place - well, as soon as the entry is updated! First of all it would be great if you start teaching your children with vocabulary then proceed in teaching the proper way of writing. The mothers group may be doing that - I don't know. I was not a part of them and they seemed to be there for support as mothers and for, I'm totally guessing, social development for the children. The restaurant's featured artists were children, too. I forgot to mention that part. It was wonderful to see some of the children there looking at art that looked like their art and admire it. It was really cool. This was a supportive environment for children and their natural creativity.